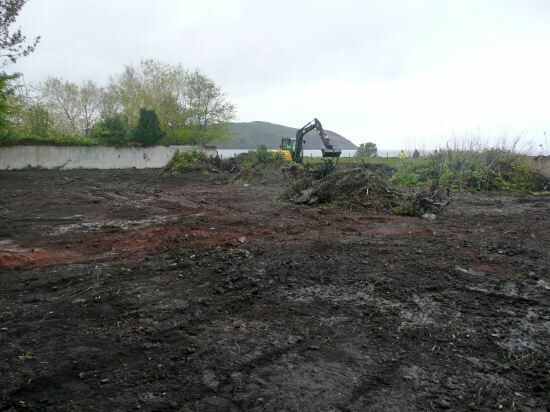 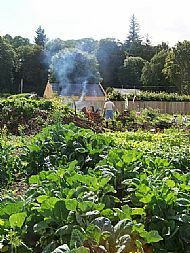 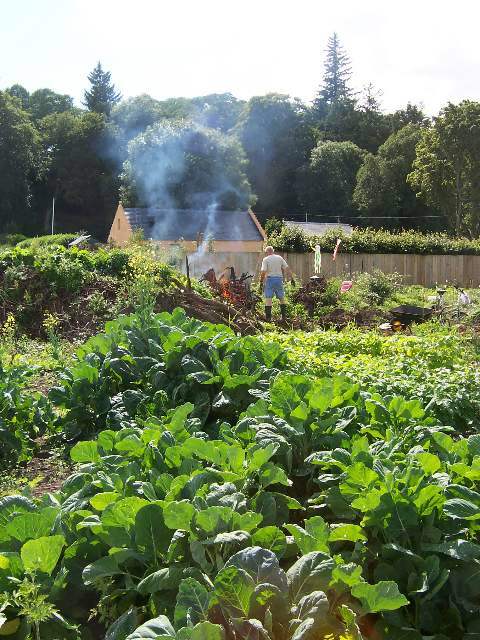 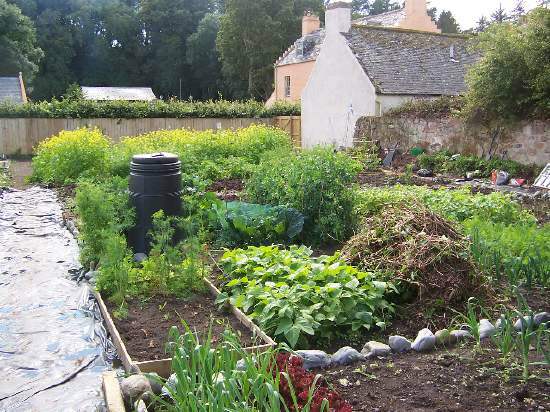 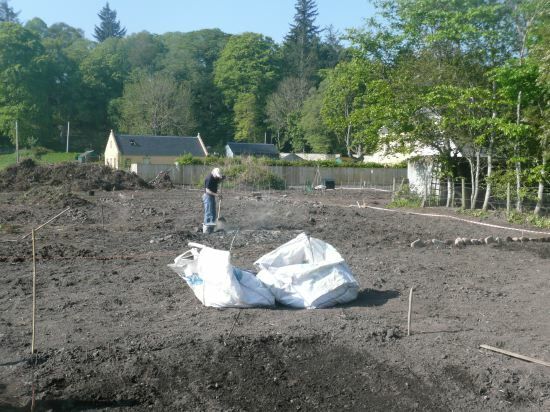 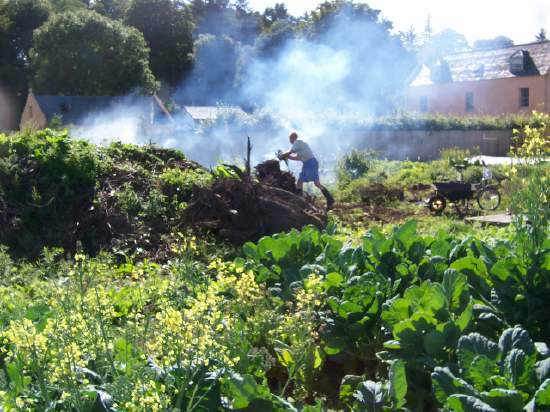 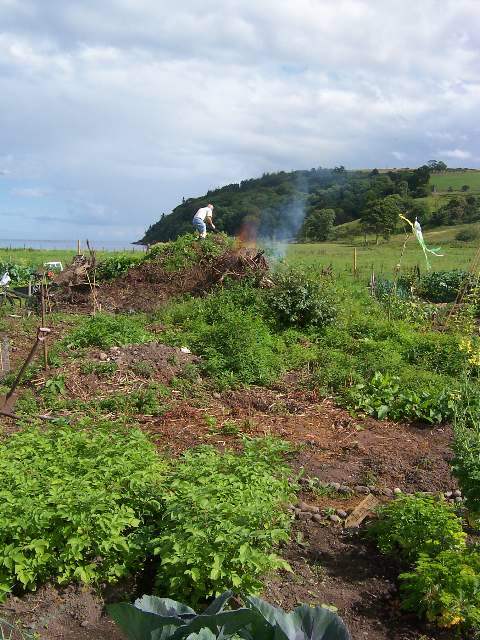 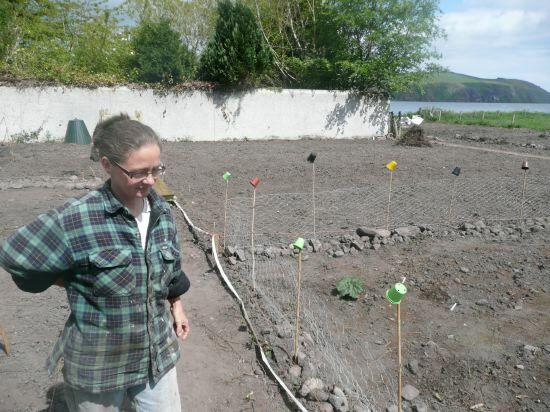 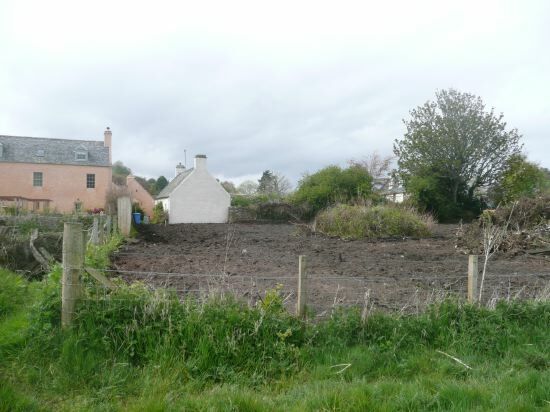 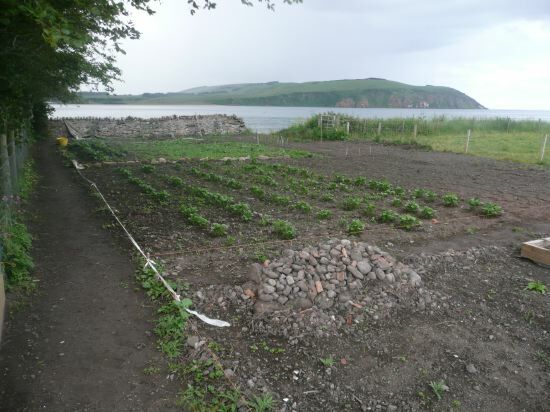 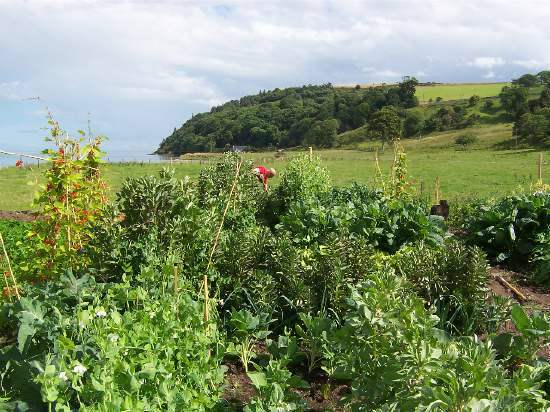 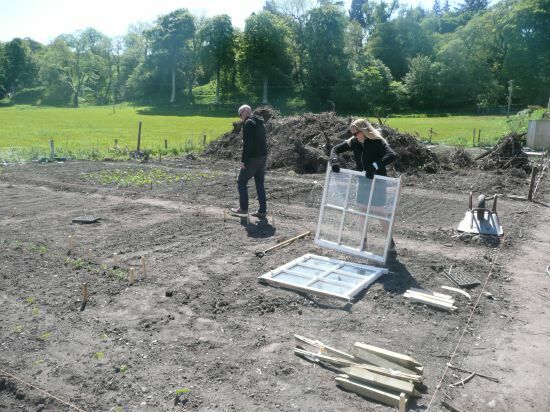 Since signing the lease with Cromarty Estate in April 2012, the society and plot-holders have been working very hard on improvements on the allotments as a whole, but also on the individual plots. 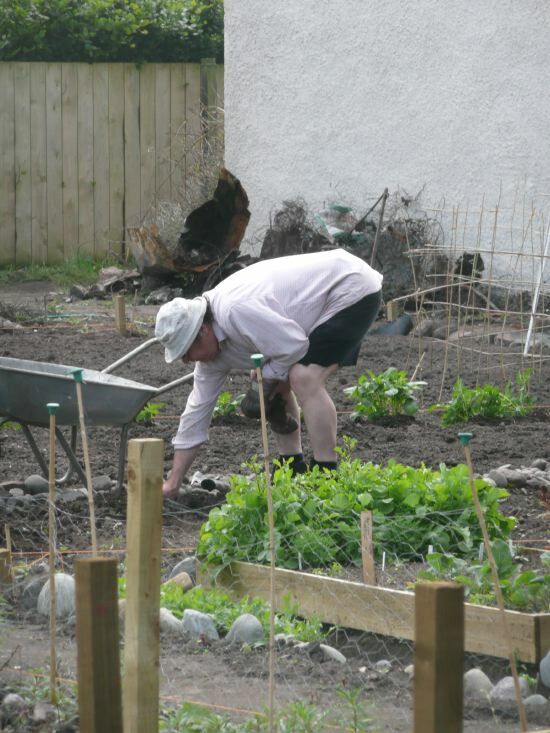 Click on the thumbnail images to view a larger version, and you can then cycle through the photos in the pop-up window - click on the wee arrows that appear on the left or right when you move your cursor over the photo. 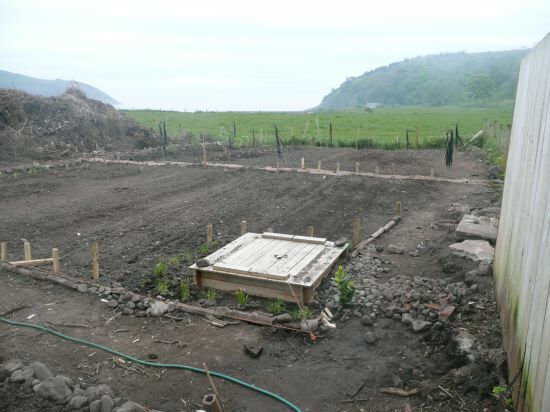 This shows a view of the Old Tennis Courts Allotments looking North. 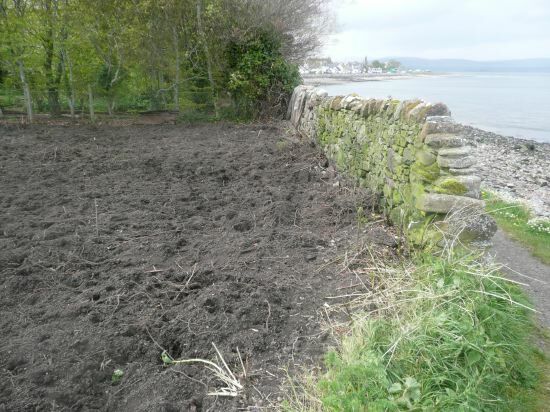 Brambles and rosebay willowherb evrywhere. 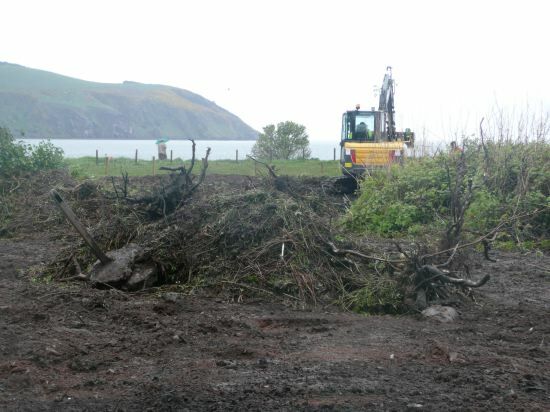 The Society has hired local landscaper, Dougie Shepherd with Alex MacKay, to clear the bulk of the brambles, etc, with a mini digger. 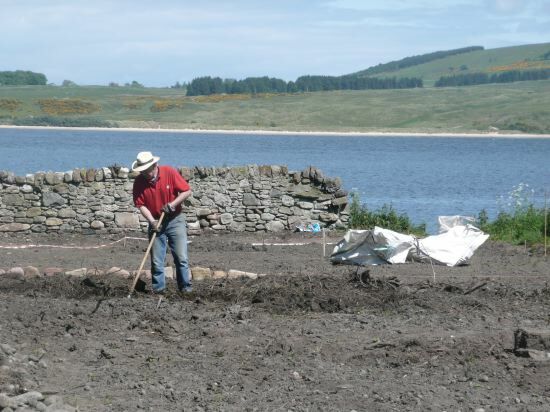 We considered doing it by hand, but this would have taken _months_. 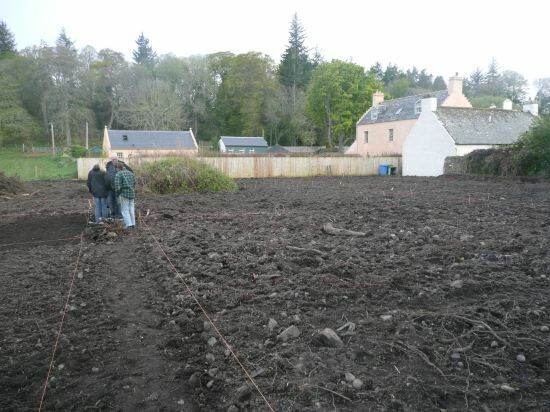 Making progress much quicker than by hand. 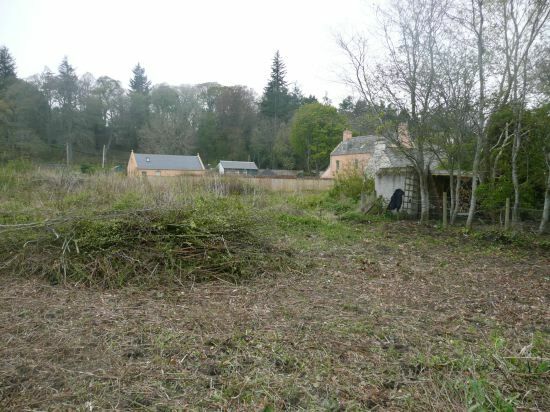 The mound of growth in the right foreground is the remains of previous clearing work by the Cromarty Estate, and this has been left due to nesting blackbirds. 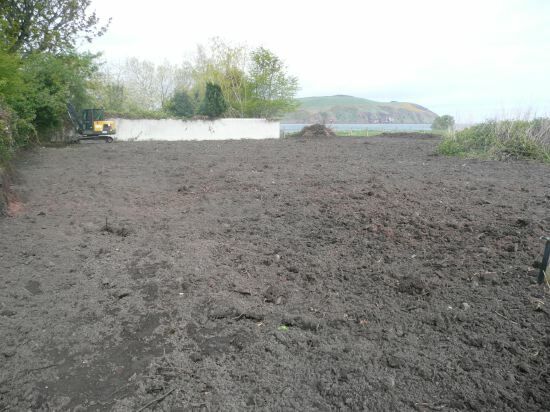 Once they have fledged we can clear this properly. 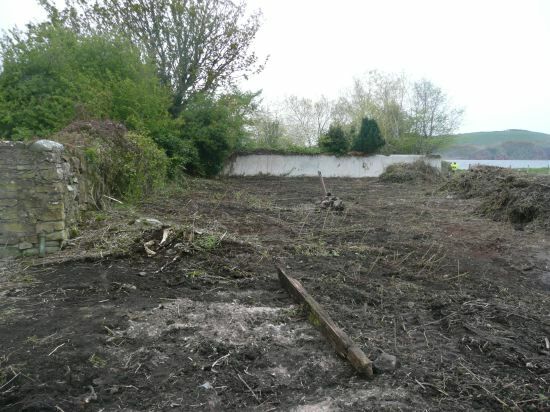 After more than tow full days of clearing, Dougie has already made a huge difference, and the society is now looking forward to getting their own hands dirty. 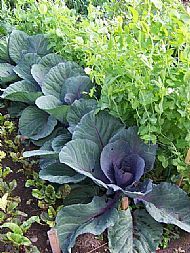 A big change, and the soil is surprisingly good. 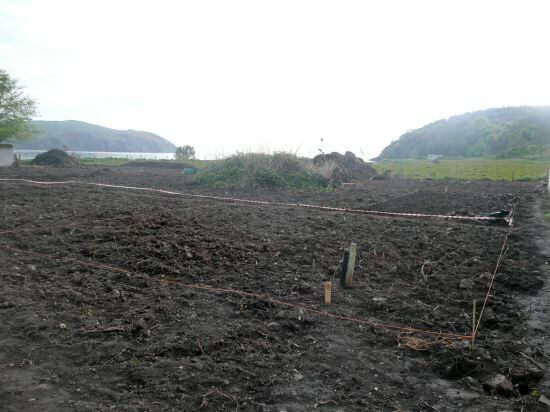 More work needed, though. 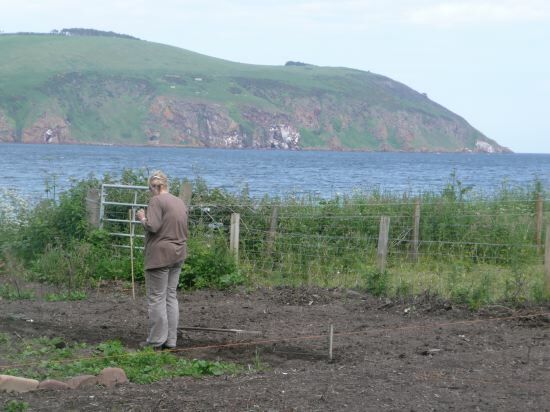 Some of the main paths marked, and marking the plots begins. Colin Miller removing stones and roots from his plot. 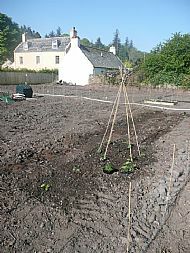 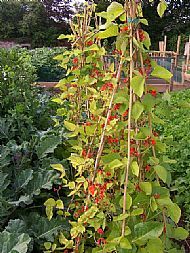 Runner Beans wigwam appears on John Woods's plot - a little optimistic, perhaps, as the eastwinds can be bad and the deer and wind fence is not yet erected. 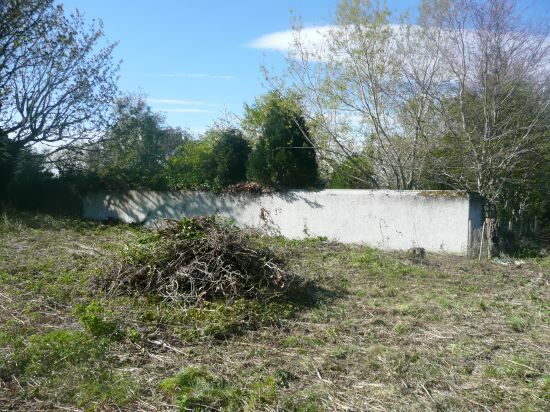 View to the north east, with the ivy growth now removed from the wall. 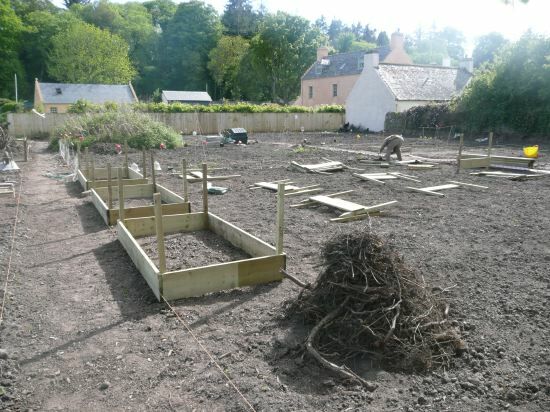 The first phase of building an extensice collection of wooden raised beds, primarily for fruit growing. 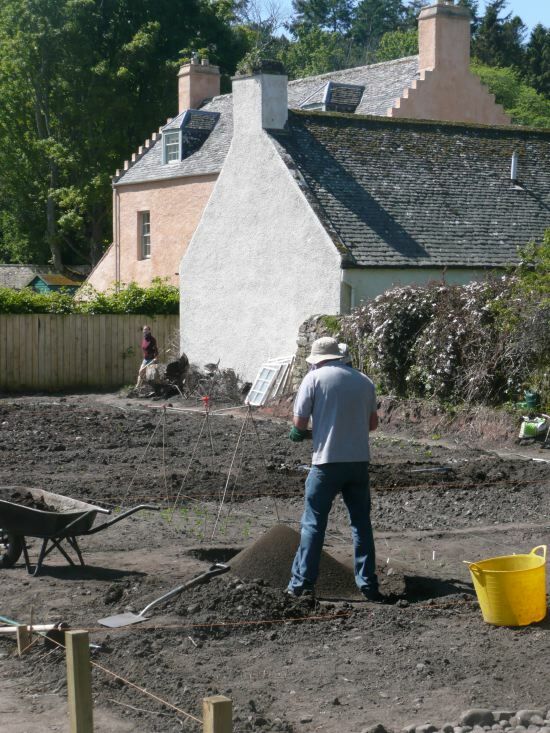 John Whyte works overtime, riddling his plot's soil to a fine-grained tilth ready for lettuces and herbs. An unusually clement day for the summer of 2012, which so far has been cool and grey. 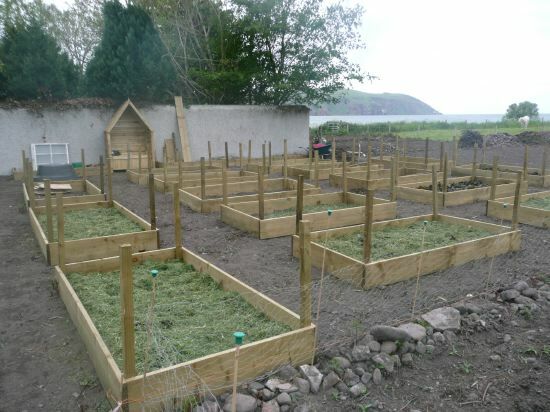 Colin's raised beds now almost finished, and mulching begins to prepare the soil for autumn fruit planting. 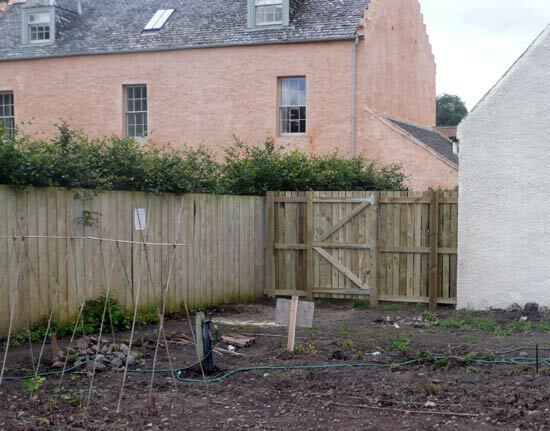 His famous 'throne' is at the back. 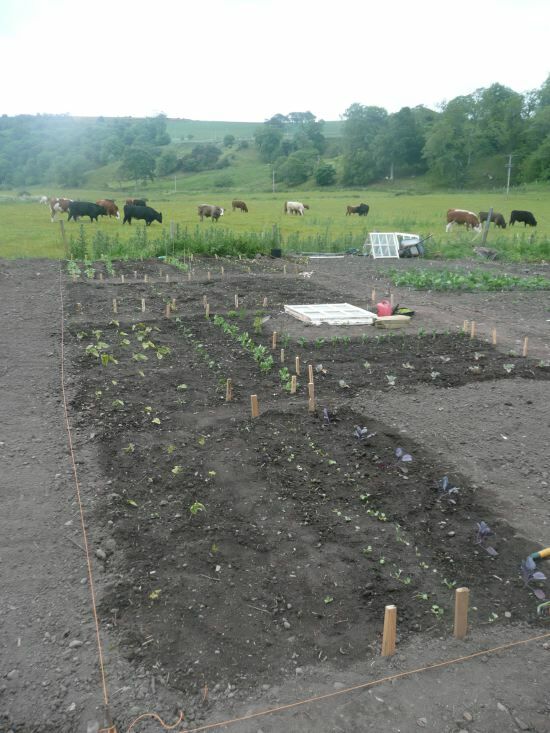 Plants in neat rows and beginning to grow, having recovered from trampling by a recent invasion of trespassing cows - culprits in background. Martin Gostwick engaged in the interminable task of removing stones from his plot. 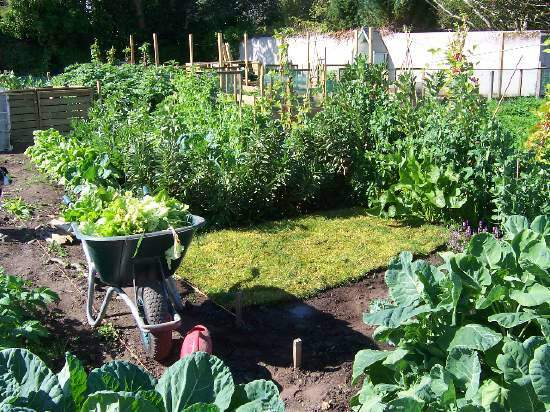 Although Jane Clunas's and Colin Miller's plots at the northern edge of the allotments have proved to have the best soil, they also seem to have the best collection of weeds. 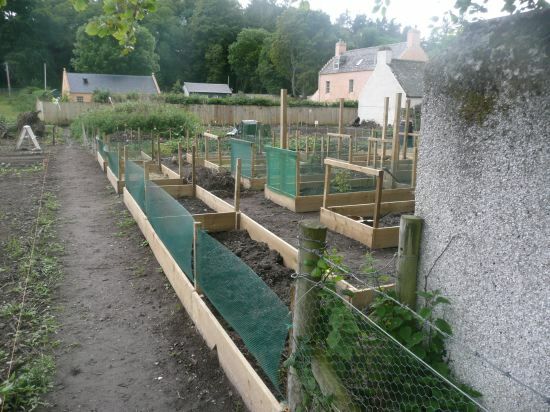 Colin's raised beds now almost fully completed and windbreak gauze added to help ameliorate the persistent easterly wind. 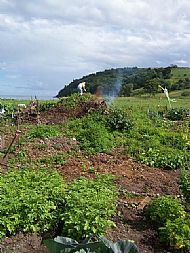 Potatoes now well under way. 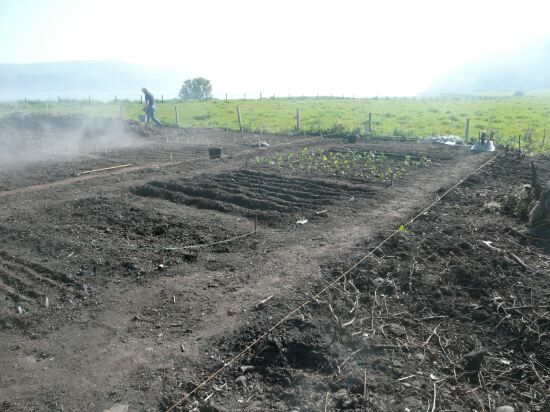 Many locals have advised that planting potatoes was a good way to clear and improve the soil for next year. 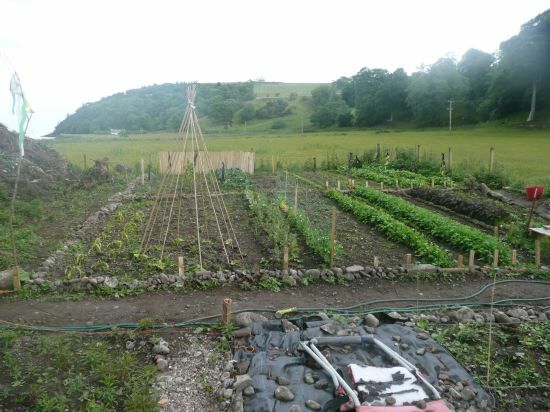 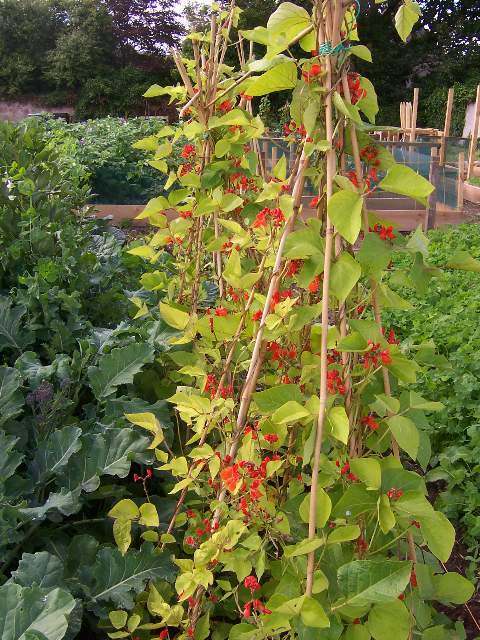 Graham has a lot of experience in managing allotment ground and growing vegetables, and itshows. 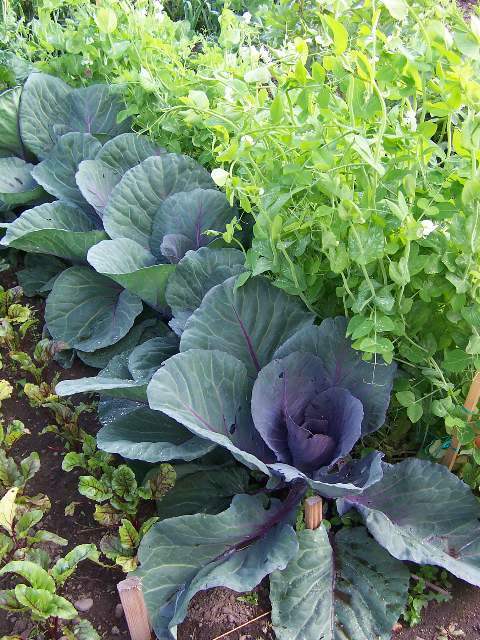 This is already the most productive plot. 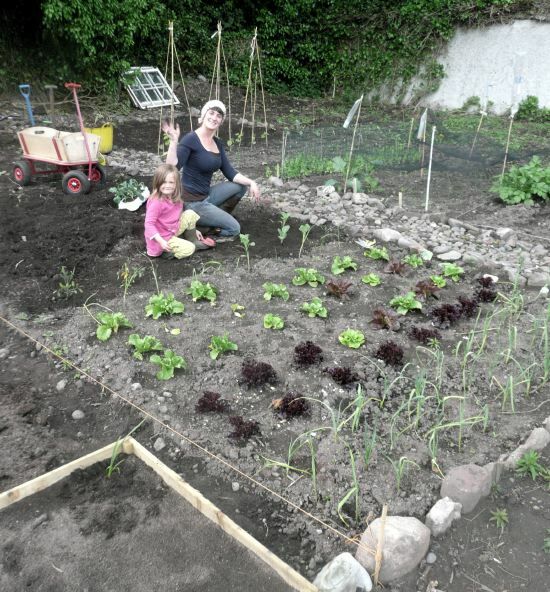 Gill, and daughter Phoebe, weeding and planting cabbages and other slug food. 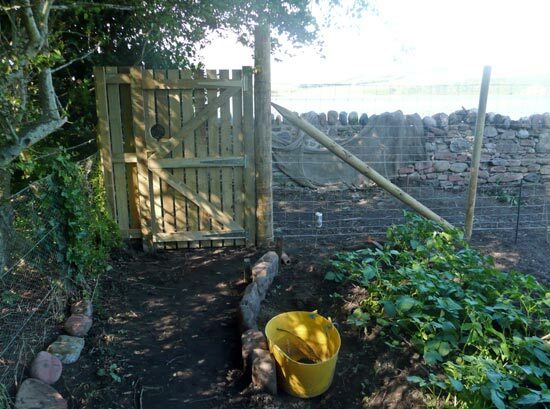 Part of the improvements made at the allotments to improve security and prevent deer and cattle trespass. 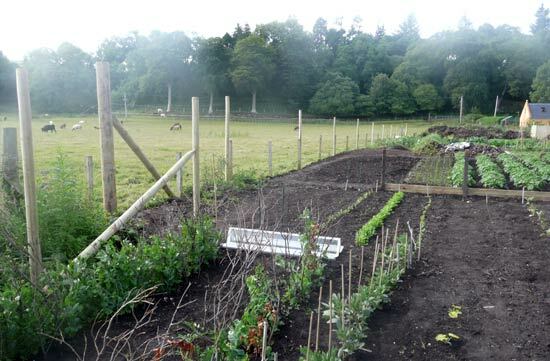 After trespass by cattle in May, this new fence provides security for growing crops.